It is in D. Solomos square, the largest and most charming of the island, that after the havoc of the earthquake in 1953 is now getting back to its original charm. The museum that for the first time was open to the public in 1960 is on three levels and in the first two rooms the visitor can admire Byzantine icons carved in the wood whereas in the third and fourth rooms there are original frescos of the 15th, 16th and 17th Century. Two more rooms are dedicated to paintings of the 18th Century and oils on canvas of artists like Doxaras, Koutouzis and Kantouni. The special importance of this museum is eventually due to the opportunity that the tourist has to appreciate the pictures and plastics reproducing the city before the earthquake besides the artistic evolution from the post Byzantine period to the contemporary Greek art. The museum is open everyday except Monday from 8.30 to 15.00. For further info it is possible to contact the following telephone number: +30 26950 42714. The museum was founded in 1959 by a club of admirers of the fine arts of Zakynthos; it is located in the striking St. Marco square and it is very famous since it keeps the relic of the two poets Dionysios Solomos and Andreas Kalvos, real national symbols. In the museum there are local art handcrafts such as paintings of the 18th and 19th Century, carved pottery, sculptures and ancient musical instruments; the section dedicated to clothes and weapons of noble families of the last century is very well attended. There are then many portraits dedicated to the most important people of the island and a collection of coats of arms. The museum is open everyday from 9.00 to 14.00. For more info please call: +30 26950 28982. The town hall library is located in a big building in Solomos square. Its story goes back to 1628 and before being destroyed by the earthquake and the fire; it kept unique papers and books of poets of the past. Thanks to the donation of some people of Zakynthos who gave to the library books from their personal and private collection, it was possible to rebuilt the past and give it back to people at their disposal. In the library it is possible to find rare books concerning the history and tradition of Zakynthos, treaties of famous writers, copies of old newspapers and memories concerning the second world war in addition to the pictures of Zakynthos before the calamity happened in 1953. 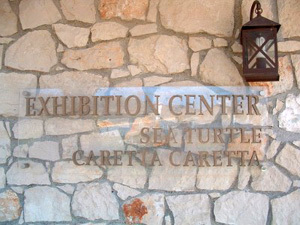 The Thematic Exhibition Center of the loggerhead sea turtle Caretta-Caretta is located in Dafni which is in the municipal department of Vasilikos. 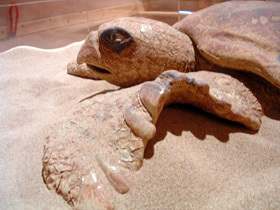 The landscaped area of the thematic centre, the exhibition and information material, the use of multimedia and memorabilia given, give visitors occasion for information and awareness on loggerhead sea turtles and its nesting beaches of Zakynthos. Its role is not restricted to the study and promotion of Caretta caretta, but extends to the acquaintance with other priority species and endemic species of flora and fauna, found in Zakynthos, linked to the tradition and history of the island. The construction of the Thematic Exhibition Center has been funded by the European Regional Development Fund and from national resources. 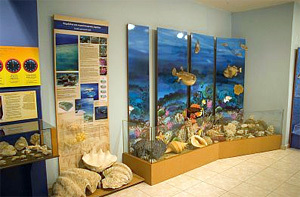 Helmis Museum of Natural History is the only one of its kind on Zakynthos. Its opening ceremony took place on the 10th of October, 2000 and the founder is Mr. Panayiotis Helmis. 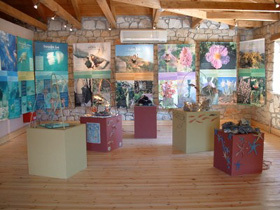 The Museum is located at Ayia Marina Village on Zakynthos island, in a beautiful, traditional building. 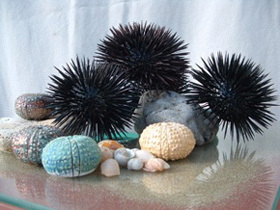 The Museum's collections include specimens from the flora and fauna of the Zakynthian nature like: rocks and minerals, plant and animal fossils, shells, fishes and birds. 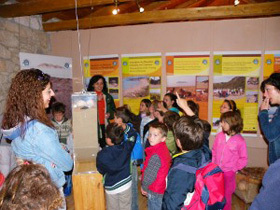 Educational material for children helps turn their visit into an amusing experience. For more information also about opening hours visit the website: www.museumhelmis.gr. 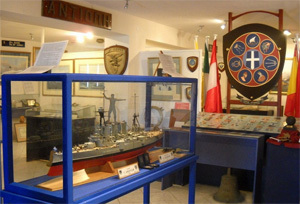 The Milanio Naval Museum is located in the tourist resort of Tsilivi. The founder is Anthony Miller and this is the only museum in Zakynthos which reproduces the maritime history of the island from the seventeenth century to the present day. The collection inside includes watercolors that reveal the whole evolution of maritime transport and a wide variety of Byzantine ships from the beginning of the Byzantine Empire until its destruction by the Turks in 1453. The museum is open from 8.00 to 15.00 by appointment only, calling this number: 0030 26950 42436. Founded in 1998 in the small village of Pigadakia, under the township of Alykes, it exhibits the culture and traditions history of the Greek rural world, typical in particular of this island. There you can admire rare works dated back to the 16th Century such as working tools, everyday tools and very rare works of ancient local handcraft. The museum is a recreation of a traditional house with living room, kitchen and bedroom furnished with traditional furniture. 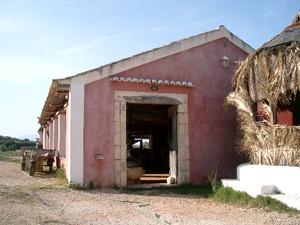 Outside there are also agricultural machinery used for grinding grain and for pressing grapes and olives.